There are many different tests online to help you pinpoint your personality type. Some have as many as sixteen different types. This kind of depth and complexity can be useful for understanding a lot about ourselves. It also infers there are only 16 types of people. It is also somewhat limiting as it doesn’t allow for change or growth within our basic personality. Cheerleaders, as I’ve mentioned before, are average to high energy output and average to extremely high people persons. They are friendly to everyone, love large gatherings, would rather move than sit, and can be flashy and free thinking. Cheerleaders have the ability to remain optimistic and gullible, wide-eyed innocents, no matter what life throws at them. The draw toward fun and games can help Cheerleaders liven up a party, but it can also make them a somewhat less than reliable employee. Coaches share the high side of the energy level with Cheerleaders but focus their efforts on achieving things. Coaches are the goal setters, the get-it-done-no-matter-if-it-kills-me people. They work well alone, but they know exactly what everyone else needs to do and they’re not afraid to tell them so. Where the Cheerleader organizes parties, Coaches organize projects. All teams need a Manager. Found on the lower right side of our grid, Managers are great at attending to details. They’ll keep the stats, organize the locker room, solve the logistics and rarely get distracted from their task. Managers think everything through carefully. They spend so much time thinking and analyzing, all of life seems like serious work to them. Fun is a foreign concept. 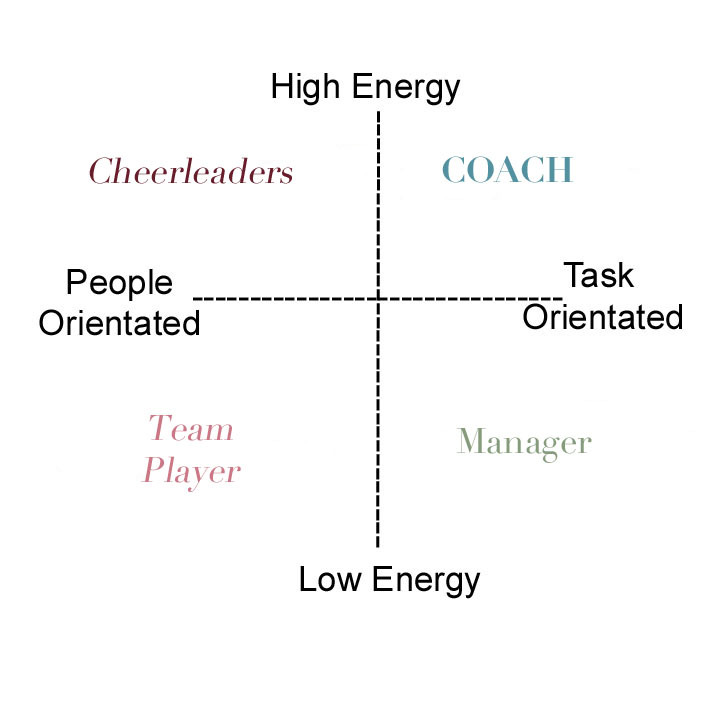 Sharing this tendency for quiet introspection are the Team Players at the lower left of our model. 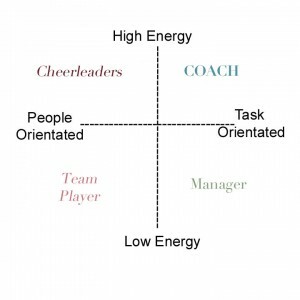 Flexible, easy going and agreeable, Team Players have the unique ability to operate in any of the other three quadrants, even stretching to the opposite corner to lead like a Coach if the need arises. They will rarely start an argument and are the first to mediate other’s conflicts. With their slower pace, Team Players can be counted on to be calm in almost any situation sometimes to the point of inertia. If you were to plot their places on the grid, each of our team mates would sit on the far outer corners. People are not so easily or obviously pegged. You might identify with the Cheerleader’s friendliness, but prefer a Team Player’s slower pace, putting you closer to the border between them. Both Managers and Team Players love to help people, Managers by devising systems to better people’s lives, Team Players by listening and serving. If you like to help people but from a distance, you might be a blend of the two. Full Coaches can be tactless and bossy, but a Coach blended with Cheerleader tendencies softens that dictatorial stance. Hopefully, our objective is to move toward the center of the grid. Still unique in our own way but overcoming our weaknesses and growing in our understanding of others. This system was made by a melancholy, aswell as the test. We’re all normal in some way or another. Neat to see you applying the information Nrmartins. This system was originated by Hippocrates in Greece circa 400 BC so it’s hard to say for sure which type he was. Or which combination of types, as most of us are a blend of two with a little of a third thrown in for good measure. I like to think that no one is normal if normal means average. Each, in his own way, with his or her own gifts, talents and personality is actually above average in some area. There’s good news and there is bad news. The bad news is there really isn’t any numerical system assigned to the graph, so for a strong Melancholy personality it can feel incomplete and a bit frustrating. The good news is you are not locked in to any one place within your personality type, the test is more of a rough guide. We really never sit rooted in one place within our type. External factors like jobs and the people around us cause us to be more or less outgoing, as the situation demands. Our emotional state (or the anchovy pizza we had for dinner) can make us more or less energetic than usual. People are very complex and, fortunately, very adaptable. Understanding our personality type is just the beginning of understanding ourselves. Ideally we are moving away from our weaknesses, which pin us into the extreme corners of our type, and moving toward the middle of the graph, and a more balanced personality. We also behave slightly differently throughout our day, depending on the situation we are in. A sanguine who works in a law office, for example, is going to have to restrain their more flamboyant impulses if they hope to keep their job. At a social gathering, they may act a very different part, letting their “life of the party” side come out to play. The personality test is not meant to pigeon hole anyone into a labeled box. But it is the best way I’ve found to help people start to understand their personality when I can’t teach them in person. I have been fascinated by ‘Personality Types’ since I read two of Tim LaHaye’s books as a teenager. Since then I have accepted myself as what I call a “MelanCholeric”… Coach/Manager in your lexicon. Last night I was the subject of a prejudiced phone call where I was labelled as “not a team player.” I googled this term, and was delighted to find your excellent Personality Type chart. As an aside, I suspect “Team Player” & “Servant Leader” are both probably what psychologists call ‘whip words’, contrived by businessmen to strike fear into the hearts of their staff to control and manipulate them. No pilot want to be labelled a ‘Cowboy’, no teacher wants to be shamed for ‘not teaching Curriculum’, no Christian wants to be called a ‘Spiritual Butterfly” or “Bitter” or “Unteachable”. As a Coach/Manager, of course I don’t take instruction well – I am unconventional, hate routine and break with tradition. Though I made a good teacher, & worship leader, generally in churches I am shunned, as there’s only room for a handful of leaders. The vast majority of believers are forced to follow, not Christ, but the pastor/s etc. who get to play to their strengths at our expense. I applaud you for taking the time to understand yourself, your strengths, and your weaknesses. I am convinced the world would be a better place if more people endeavored to understand not only their own personality, but that of the people around them. It would foster much more compassion and trust in the world. If you look at the personality grid, you’ll notice it forms a cross in the middle. If you were to “plot” Jesus’ personality on it, you would find Him right in the middle. A perfect balance of all the best attributes of each personality without any of the weaknesses. It’s our job to get in harmony with His work within us so He can draw us closer to the center and farther away from our weaknesses. It sounds like you are making strides in that journey! On behalf of leaders in ministry everywhere, I would ask for your patience and forbearance when it comes to pastors who seem reluctant to let others take on some leadership responsibilities. I can tell you from hard experience, pastors walk a fine line when it comes to letting go of authority. In every congregation there are always a few people who could be charitably called “little generals” and their mission seems to be to gain some measure of leadership authority and then go on to usurp the pastor’s influence in the church. Often it’s a matter of taking the time to build up a solid relationship with the pastor before they will put someone in a position of leadership. My guess is perhaps some of the pastors you have encountered have been burned once or twice by usurpers and are now a bit more careful about letting go of authority. By the way, I took a peek at your website. I love the images you have there. They are simply breathtaking. Beautifully done! I love the Temperaments! My husband, who hasn’t studied them, often refers to me as Eeyore. Have you read “The Temperament God Gave You?” (Bennetts). That and the Love Languages are my favorite parenting books. I have 3 sons (17/Phlegmatic with some melancholic; 8.5 same as above but flipped, 4.5 probably a mixture of sanguine and choleric) and my 14.5 year old daughter, sanguine with some strong choleric attitude but often as unmotivated as a phlegmatic having a bad day. My husband is phlegmatic/sang. Thank you for your insight! What a blessing to your family to have parents who respect the differences in the personalities of each child. We are called to train up a child in the way they should go, not the way we think they should go, and understanding that each one is created with unique gifts and abilities as well as a unique perspective on the world is a great start. I bet you will find your daughter is very motivated to do those things that interest to her. At her age kids can be very mopey and seemingly lazy because they are in that transition between child and adult. They have lots to think about in addition to having a body that is changing on them. It’s a tough time. Boys are easier 🙂 God bless. Cheer on! The world needs your unabashed love and fun-loving spirit. Cheerleaders are the folks who make everyone feel loved and accepted and we need as much of that as we can get. I’d love to find out more cheerleader careers! I’m am enfp – ADHD to the max and this personality type fits me sooo well. Ben, I’m glad you are so self aware. It means you won’t waste time pursuing careers you know cannot possibly fit your personality. You’d make a great coach, ski instructor, car salesman, party planner, emergency worker (EMT, firefighter, police), independent contractor or freelance worker. Pretty much anything that allows for variety, lots of movement, creativity, and independence will be a good fit. You might want to look at a book by Barbara Sher called “Refuse to Choose“. She coined the term “scanners” to identify people who have wide ranging interests and passions which flare for a time and fade once they conquer that pursuit. The book is very encouraging for those of us who don’t stick to slogging along in one career our whole lives but would rather embrace as much of the world as possible. She highlights many stories of people who have made a living at following their multiple passions. As a freelancer or independent contractor, you’d be free to do an unlimited variety of short term, contract based jobs anywhere in the world you wish. Cheerleader types also make great entrepreneurs because you have a brain full of ideas and the energy to pursue them with single minded focus. Just be sure to surround your self with people who can help you stay on schedule and mind the details for you. Remember God made you the way you are because you are created in His image. He is creative, passionate, and people-loving. You will bring glory to Him by making the most of who you are.